Home > To Fast or Not to Fast? Fasting white paper: is fasting still recommended prior to a paramedical exam? Preparing applicants for an insurance application exam usually includes instructions similar to those given prior to a physician checkup. Applicants are advised to follow their normal routine, take medications as usual and not partake in unusual heavy physical activity just before the exam. They are also advised to fast when blood will be drawn for analysis. However, the majority of insurance exams are not done early in the morning, but rather fit into a schedule that is convenient for applicants. 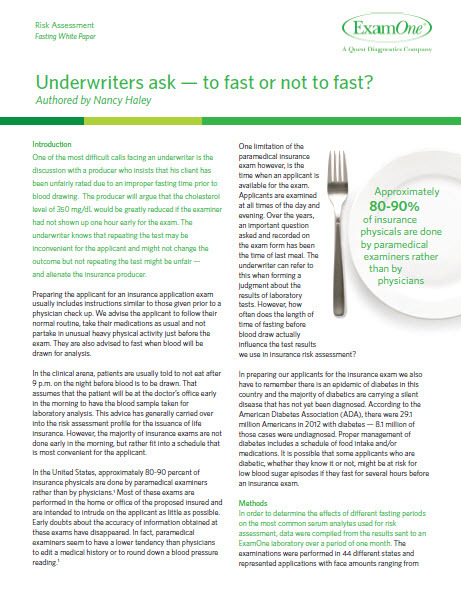 So, how often does the length of time of fasting before a blood draw actually influence the test results used in insurance risk assessment?